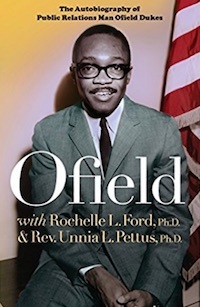 Ofield Dukes, who broke barriers erected against African-Americans through his political activities and professional work as the founder of Ofield Dukes & Associates, one of the first Black-owned PR firms, tells his story in a new book released by PRMuseum Press. Ofield: The Autobiography of a Public Relations Man is valuable both as a story of the hurdles faced by African-Americans as they made a place for themselves in this country and an example of how the tools of PR can be used to transform society. Taking the reader from Rutledge, Alabama, where Dukes was born in 1932, to the globe-trotting life he led as an advisor to Lyndon Johnson, Hubert Humphrey and many other political and cultural figures, the book combines personal anecdotes with pointed advice on how PR pros should conduct themselves and their business. After completing a tour of duty in Korea and earning a degree at Wayne State University, Dukes started his professional career in 1958 writing for the Michigan Chronicle, and soon after became news director of WCHB, a radio station near Detroit. It was there that he got his first contact with the world of presidential politics when he covered a 1960 visit John F. Kennedy made to Michigan. By 1964, he was on President Johnson’s staff, where he got a close look at how political power is wielded. That knowledge served him well. Writing about his work with Coretta Scott King, Roots author Alex Haley, the Congressional Black Caucus and such musical figures as Stevie Wonder, James Brown and Diana Ross, he describes how he was able to combine diligence, social savvy and a strong dose of self-respect into a powerful force for change in business as well as society at large. Edited by Rochelle L. Ford, chair of the Public Relations department at the S.I. Newhouse School of Public Communications and Rev. Unnia L. Pettus, who has taught at Howard University and Bowie State University, Ofield reveals a PR pioneer whose lessons have particular relevance in today’s harsh and uncertain media environment.